"Kuper's own provocative, conscience driven work has made him one of the most important activist artists of his generation." -- Douglas Wolk, World Art Magazine. A collection of politically charged strips, by the award winning cartoonist Peter Kuper, that stare into the gaping jaws of hypocrisy and -- without blinking -- punch them in the funny bone. 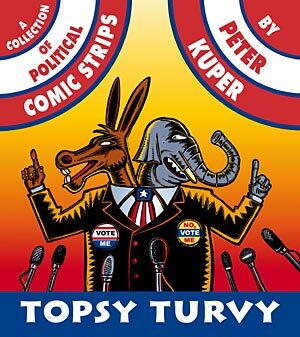 Topsy Turvy, an 80-page softbound collection, includes political cartoons that have appeared in Time Magazine, The New York Times opinion page, The Nation, and The New York Daily News, among others. -- 80 pages.